As the kids get older and move up through school, access to the family computer for this desert-dwelling, DIY-blogging dad has been getting more and more scarce. Finally, since the beginning of the year, I've been putting all my content together on my handy Surface Tablet. Usually, this consists of me on the couch or propped up in bed with the tablet perched on a decorative pillow. I peck away at the keys while the computer wallows around like a sinking barge. I've wanted to build some kind of lap desk for quite a while, but now that I've been precariously blogging on a pillow or a few months, I decided it was time to get it done. This lap desk is a cool, inexpensive project that can be done in a couple hours with some basic tools. I still wanted mine to be visually attractive, so I did a cool torch-burned finish to bring out the detail in the wood. I started by picking out some 1 x 6, select-pine boards. I chose straight, clean boards with some neat character in the grain. Since I'd be slightly burning them later with a hand torch, I'd bring out and celebrate that character. Boring, old straight grain wouldn't be very visually interesting would it? I also wanted a smooth surface for writing or using a computer mouse. The select pine is nicely sanded on all sides and is free of knots. Three, warp-free, straight-edged beauties, with plenty of character. As usual, I decided to overbuild; no dainty little teacup sized desk for me. I'd build a monster, 16 1/4" deep by 22" wide panel to top my lap desk. I'd be able to land a standard World War II naval fighter plane on the deck of this beast. I picked the most interesting sections of grain and lopped the boards into three properly sized planks on the miter saw. Any type of straight cutting saw can do this step, but I seriously love the speedy precision of a miter saw. I cut them one at a time, but did a final precision shave to the end as a group, just to ensure the boards were perfectly the same length. One of the reasons I chose the select pine is that it is pretty straight and smooth on all sides. I was able to lay the boards out as a tight-fitting panel, right from the store. I didn't have to run them through the table saw or jointer to square up the mating edges. Of course select grade costs more than rough lumber, but it's a real time saver. I drilled a series of pocket holes along the length of the boards. They'd get screwed together and be workable sooner than glue-only assembly. Even if I'm screwing a panel together, I like to use a good wood glue, to keep it super solid. It also fills any minor gaps that may appear between the boards. Flip the middle board over so the circular end grain curves in the opposite direction as the boards it will be mated to. Wood can cup slightly as it ages. If all three boards cup the same direction. In time, the piece could develop a significant curve, rendering it unusable. I clamped the panel together to avoid shifting and ran pocket hole screws in with an impact driver. The select pine is pretty smooth stuff right from the store, but there are still little dings, dents and imperfections. I gave the whole piece a good, long sanding with 220 grit paper on the random orbital sander. It also cleaned up the slight differences in the mating plank edges as well as a little bit of dried glue. I eased the edges with a piloted round-over bit in the router, flipped the panel over, and rounded the bottom side. Shown with an optional arm-hair, sawdust-catching feature. A quick hand sanding with 220 grit got the whole piece nice and smooth. Finishing the Top - Flame On!!! This is where it gets really fun. Fresh pine is pretty pale in color and doesn't show much character unless you stain it, OR use a cool wood-burning technique with a handheld torch to bring out some visual interest. I chose the Bernzomatic TS-8000 with a propane cylinder to toast my brand-new panel. I practiced with a piece of scrap wood for a while to get my technique in line before going live. I set my panel on the garage floor, pulled the trigger to spark the TS-8000 to life, and floated the torch across the entire width of the panel. I moved the flame along the grain at a steady pace, similar to using a can of spray-paint. I found it was best to burn the wood very lightly as I went, using those broad strokes. With more time under the flame, the darker it got. Just like spray paint, it's easy to overdo it if its held too long in one place. Of course, I know all about overdoing it whilst burning wood. Last time I went for a torched wood finish, I didn't stop until it was charred coal-black. This time, I just wanted to toast it enough to bring out the character in the wood, and give it some color. I'd skip the skull and crossbones on this project too. I continued to ease the torch back and forth, slowing down where I found an interesting detail in the grain that I wanted to bring out. The further I went, the more it felt like spray painting; I could blend the burned, patina effect by alternating the distance and angle of the flame to the piece. There were a couple little areas I overcooked, but it was easy enough to touch them up with a light hit of the 220 grit sandpaper and a revisiting of the TS-8000's blue flame to blend it in nicely. When the top was done, I toasted the edges and the bottom. The cushion wouldn't cover the entire back, so I wanted the exposed areas to have the same look as the top. Once the torched finish looked the way I liked it, I wiped the piece down with a soft, slightly damp cloth to remove any loose soot. I gave it a good protective finish. 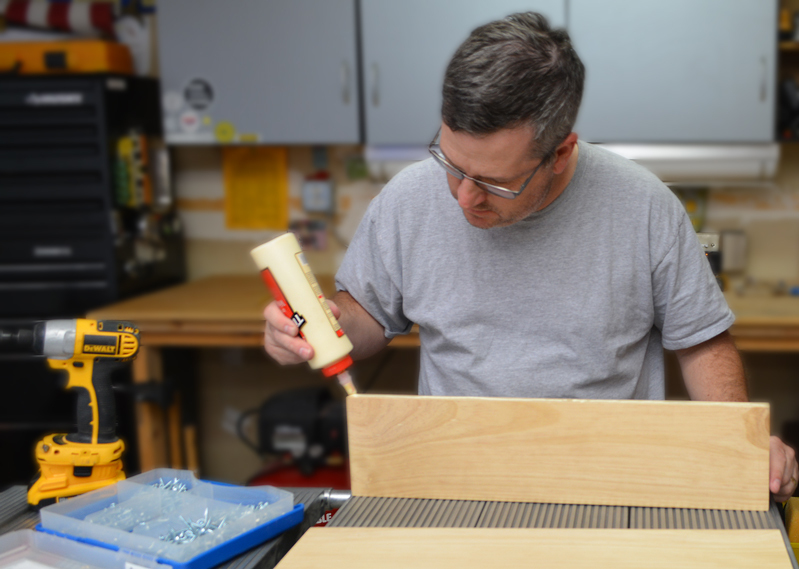 I like to use several coats of a good-quality, clear lacquer spray, with a very light hand sanding between coats. Look how rich the color is with this burned finish method. It's unbelievable that this is fresh, new wood, with no colored stain added. This was just pale, clean pine, lightly toasted by the TS-8000, and covered with a clear lacquer. I'd never been in a fabric store before. I now know how it feels when someone goes into a lumber yard or hardware store for the first time. Weird terms, an unfamiliar method of purchasing, and a huge variety of product types confused the heck out of me. Eventually, I found the upholstery section and picked a heavy -oven, earth-tone cloth, with bits of black in the texture. It looked very similar to to our living room couch. My next stop was the local craft store where I picked up a perfect-size piece of foam. I cut a piece of 1/8" plywood to match the foam. It would form the top of the cushion piece and provide a solid surface to staple the upholstery. Stapling with heavy-duty T-50 staples. I tucked and wrapped the fabric like a present, popping a staple in every two inches along the edge of the plywood. I pulled the fabric up tight on the corners to give the whole cushion a slightly rounded, pillowed effect. The plywood got a good dose of a super-strong Liquid Nails adhesive. I ran a bead of adhesive atop the fabric too, just to get a little extra locking power, but I kept it away from the edge where it could glop out and be visible. The final step was to center the cushion on the back of the roasted-toasted desktop and mush it down to goosh the adhesive into both pieces. About 20 lbs. of old floor tile stacked atop a scrap piece of the thin plywood did the trick. That's it! The final step is to let the Liquid Nails dry. I'm actually sitting on the couch right now, with my handy new burnt wood lap desk, writing this blog post. I sized this pretty large because I like to use a mouse instead of the track pad when I work. I also like to support my wrists while typing. It's plenty big, but still small enough to tuck behind the couch, under the bed, or in a closet for storage. This beautiful lap desk is perfect for the compact Surface Pro with a type cover and its kickstand style setup. I also used a standard size laptop (Toshiba) for a while, just to put the desk though its paces. I...can't. ..feel... my... legs. I guess a twelve-ton, 27-year-old Macintosh "Portable" isn't really the target machine for this particular lap desk. This was an inexpensive and fun afternoon project. It's very easy to build with a variety of tools, materials, and methods.